Crab Apple Trees (Malus) are valued as a spring flowering ornamental tree, and with some varieties, for the crab apple fruit that is used widely in jams and jellies as well as for apple cider. Both white and pink flowering varieties are available. They make a useful spreading small shade tree and many have good autumn colour as well. Crab apples are a tough tree that cope well with a range of conditions and once established require little care or pruning. 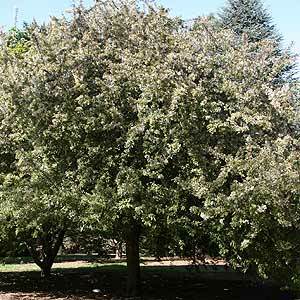 Dwarf crab apple cultivars that will reach a maximum or around 3m are also available. For flowers (but not much fruit). 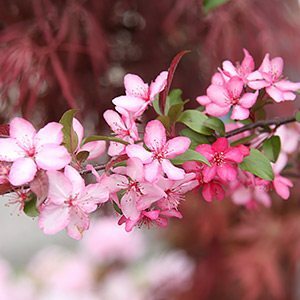 Royal Raindrops – A pink flowering Crab Apple Variety. Malus floribunda or ‘Showy Crabapple’ is one of the best white flowering varieties (see picture right). Reaching around 5 – 6m depending on conditions. Malus hupehensis is one of the better pink flowering crabapples. Malus x atrosanguinea is a NZ cultivar and one of the best for fruit, along with the John Downie Crabapple (Malus John Downie) which will reach around 8m depending on the rootstock it is grown on. New cultivars such as ‘Royal raindrops’ woth its very attractive pink flowers, and ‘Sugar Thyme’ with new pink buds opening to white flowers are well worth looking for. Malus ioensis ‘Plena’ or Bechtels Flowering Crabapple is a favorite white to pink flowering cultivar. Malus ioensis ‘Rubra’ has pink to red flowers. 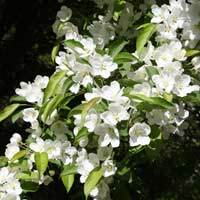 Malus floribunda or Japanese Crabapple is very popular with masses of white flowers in spring. Malus floribunda ‘Pendula’is the Weeping Japanese Crabapple usually grafted as a standard. Malus spectabilis ‘Plena’ has large attractive ‘double’ flowers. Malus baccata ( Mandshurica Siberian Crabapple ) is another worth looking for. Malus Trilobata is probably the best upright crab apple with deeply lobed foliage and large white flowers. This one will reach around 5 – 7m and is excellent as a landscaping variety, could be used to line a driveway. Malus tschonoskii is another upright form. A well drained soil is best. Dig over and add some well rotted compost. Do not dig down into heavy clay soils. Water in well after planting with a liquid seaweed fertiliser. Water through the first summers. Crab Apple Trees are available from the following nurseries and growers.